I am a 59-years old woman, a retired nurse, a wife, a mother and grandmother who was recently diagnosed with early bilateral Dry Macular Degeneration. Additionally, I have a questionable left optic nerve, a right Macular Pucker and slight cataracts. Still, I had no idea I had serious problems with my eyes until my last eye appointment. To say I am scared of what the future brings, would be an understatement. I have seen a retina specialist, but he is too young and in a hurry. Can anyone from Chicago recommend a wonderful retina doctor for me? In the mean while, I have been working hard to research all the possibilities that may be available for me, from taking vitamins to stem cell studies. I am also interested in the latest studies about hormones,i.e. DHEA as a possible supplement. Can anyone guide me on this subject?. Tonight, I am attending a lecture by Dr. Stuart Richer from Glenview, IL at the Lighthouse North Center. He has done several studies about vitamins supplements and the proper doses, especially the Zeaxanthin and Lutein. I am hoping to speak with him personally after the lecture. I intend to write letters to the different doctors in the US who may be conducting stem cell studies with the hope someone will respond with information to guide me. If anyone has knowledge of these studies or if anyone knows of more advance studies taking place in other countries, I would be grateful to hear from you. I am sure your multiple eye conditions is the cause of much concern and worry. You are doing the right thing to become as educated as you can and becoming an informed patient. Please share with us what you learned from Dr. Stuart Richer on the role of lutein and zeaxanthin supplements in AMD. Glad you are stable. I am wondering why you are not taking the AREDS2 formula, which is the only formula proven to reduce our risk of advancement? Bauch + Lomb, and maybe someone else make this formula. Make sure it's "AREDS2", which is the name of the study that used this formula. I thought all ophthamologists recommended it, so not sure why yours has not. I have intermediate stage and am 58. Like you, I wanted to find studies that might help me. I found one for dry AMD like yours and mine, in Utah, but because of my high myopia, I am not a candidate for the study, but you might be. If you go to www.clinicaltrials.gov, start looking around for trials. Type "dry macular degeneration" in the search bar. As a former pharmaceutical employee, I would never go into a Phase 1 trial as those are just dose finding/toxicity trials. The one in Utah was a Phase 2 trial. Anyway, you will find the exclusion criteria, and the email of the principal investigator running the trial. The guy in Utah wrote me back in about an hour -no lie. Unfortunately, like I said, I am not a candidate. Hopefully you'll find other trials on clinicaltrials.gov as well. 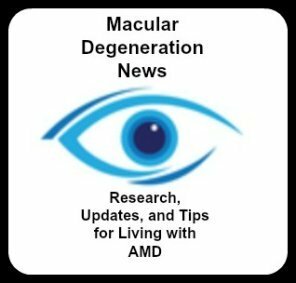 Also: there's a great macular degeneration community page on Facebook where people share stores and give support. Update. My last appointment with my retina dr was positive as far as my macular degeneration....stable and still in the early stages. However, I have many floaters and daily light flashers following my cataract surgery two months ago. My retina dr tried to reassure me that an increase of floaters following eye surgery was not unusual and there are no tears in the retina even though I have daily flashers. Still, I do have lattice so I am more prone to retinal tears and detachments. I swear, the possibility of a retina detachment is more nerve wracking then Macular Degeneration. Has anyone else experienced floaters, flashing lights only to have your dr tell you not to worry? Six weeks of flashing lights!! He told me there is a procedure of using a laser that can re-enforce the weak area....lattice. However, he stated that research has proven most of the time, the laser was unnecessary so most retina drs avoid using laser to prevent retina tears. He told me I was a low probability. My eyesight is good following removal of the cataract but the fact remains I now have several eye problems. I am just tired of being scared. Presently, my eye site is stable. I am still a Gluacoma Suspect, but all those tests were negative and my pressures are within normal range. I intend to have cataract surgery come spring and hoping for good results. My macular condition has not changed. I take Medop Maxi Vision and Whole Body supplements twice daily. I believe this brand provides what my eyes need. I take Carlson liquid fish oil, twice daily. I take a high dose of Krill oil. I eat, faithfully, raw kale, orange peppers, spinach and raw Gogi Berries daily...salmon 2-3 times weekly. I wear sunglasses with amber tinted lens. You can find lectures by Dr. Stuart Richer by going to google. He is an eye doctor who runs trials on VA patients, eye health and proper nutrition -supplements. I find his work encouraging, but there are many doctors who speak of nutrition and the right vitamins. I am not as scared as when I first was diagnosed. I know my eyesight can change at any given moment. But, until there is available treatment for dry macular degeneration, at least I feel I am doing something positive by being disciplined in my diet.